I currently need three additional stays at Starwood to re-qualify for Platinum. While my plans for next year are unsure due to the acquisition, I thought it would be worthwhile to re-qualify since I only need a few more stays. 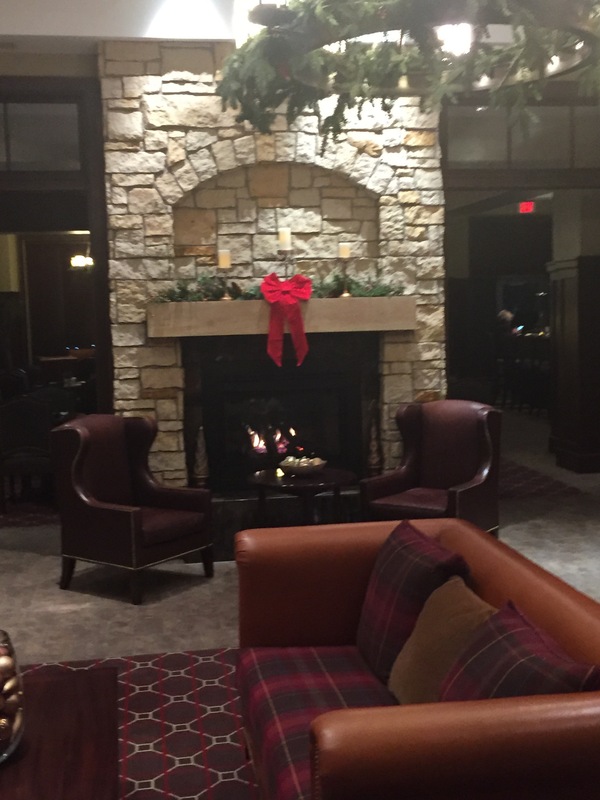 Last week, I did a mattress run and stayed at the Sheraton Woodbury, Minnesota Hotel. 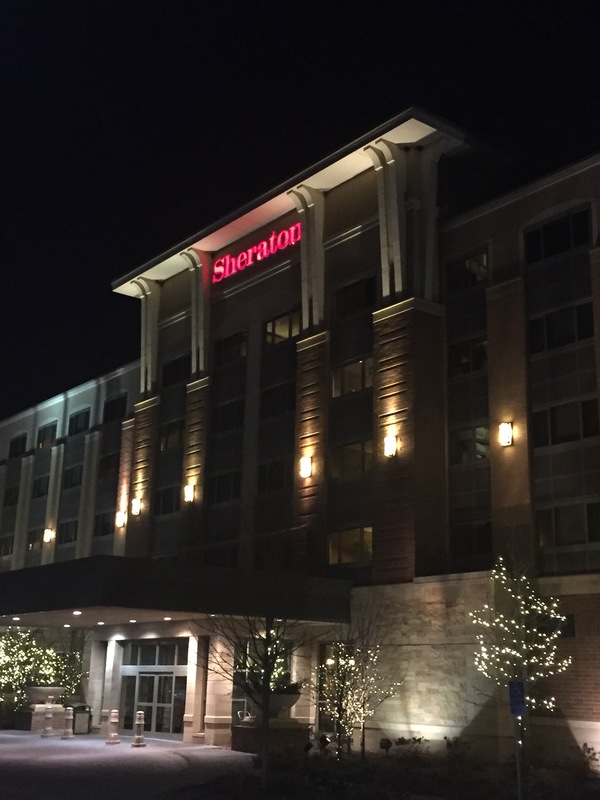 The hotel is one of the newer designed Sheraton’s and it looks identical to similar properties. I booked the stay online at a rate of about $90. 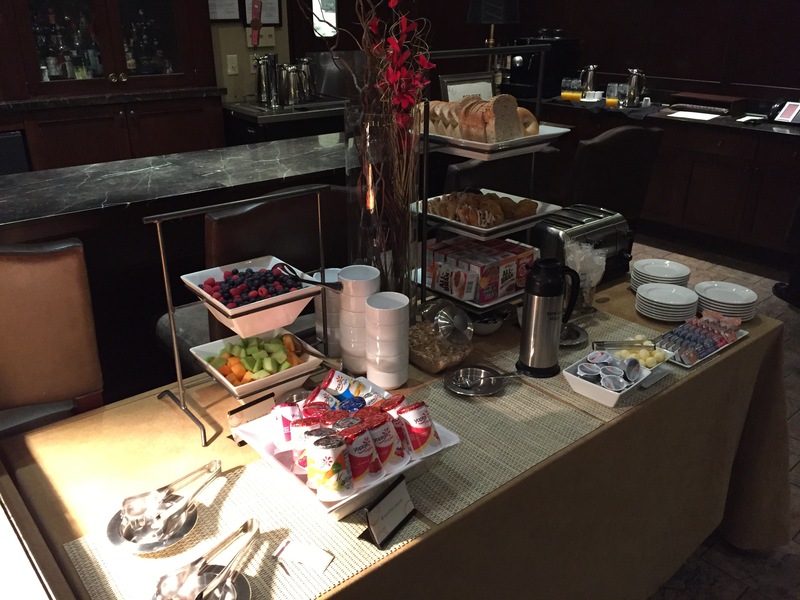 The hotel features a club lounge with appetizers and breakfast. The property was less expensive than the Four Points or Aloft properties in the cities, so I selected it for the stay. 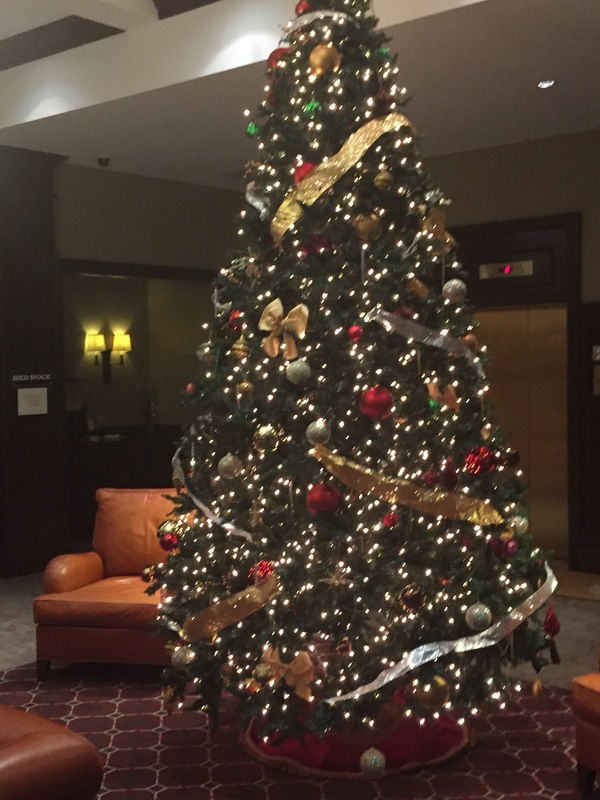 I arrived and found the lobby decorated for the holiday season with a large tree and other December holiday decorations present. Music was set at a good level in the lobby. I approached the front desk and one colleague was present and zero other guests were waiting. The colleague welcomed me to the hotel and offered assistance. After I provided my identification card and credit card she welcomed me back and thanked me for my SPG loyalty. The colleague asked if I wanted points for the amenity. I accepted and she thanked me. 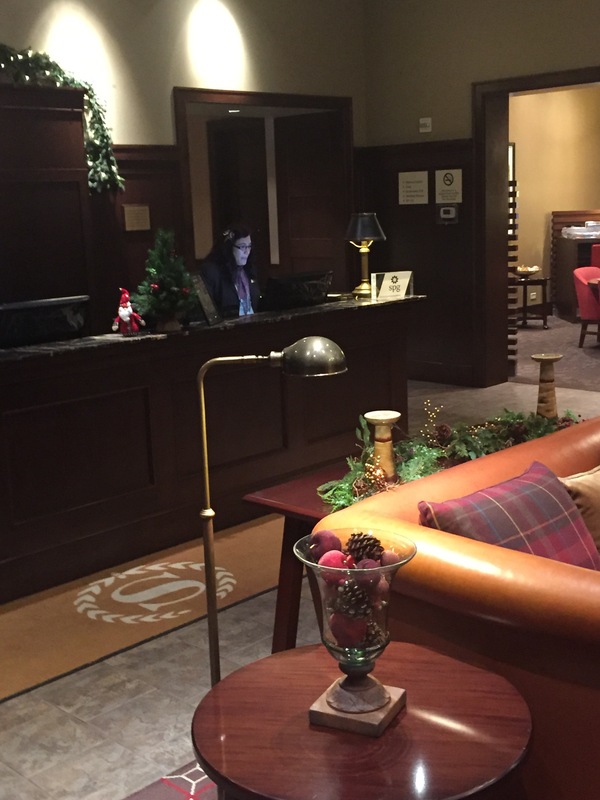 The colleague said that the hotel’s club lounge was being renovated, so they converted the fourth floor to the club level that week. She said there were some snacks available by the elevator and she offered two coupons that allowed me to get an appetizer at the bar in the evening and the breakfast buffet in the morning in the restaurant. The colleague thanked me, presented a key packet that was prepared prior to my arrival at the desk. The colleague wished me a good stay. I attempted to utilize the keys to access the elevator; however, they were not keyed correctly. So the elevator did not move. I opened the doors and returned to the desk and the colleague apologized and she made new keys for the room. 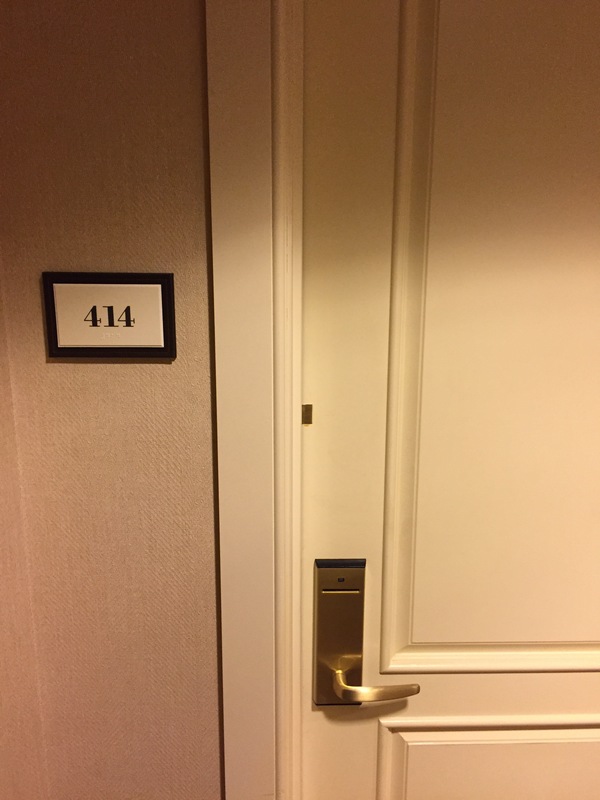 I was assigned room 414. A standard king size bed room. When I arrived at the room, the key worked correctly to open the door. The room was clean and it was setup neatly. 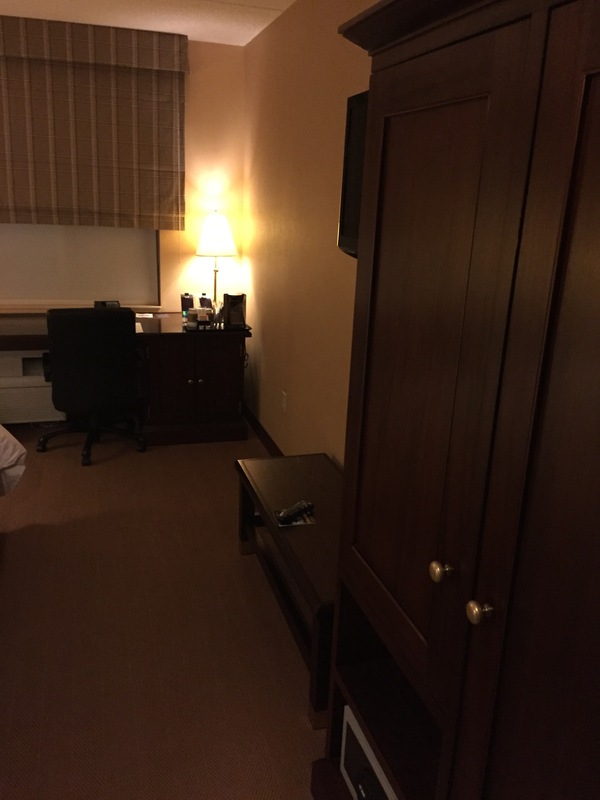 The room featured the king size bed, a small dresser, TV, desk and chair. 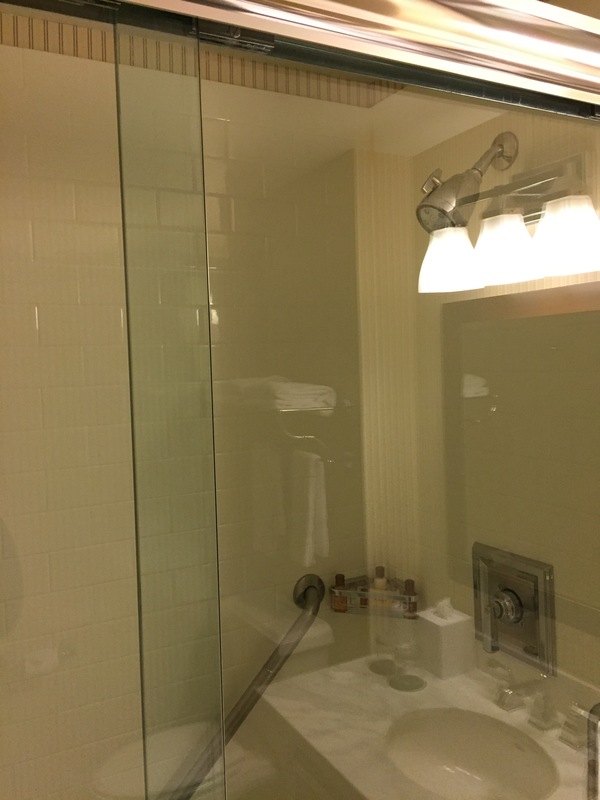 The bathroom included a shower with a standard shower head and a small sink/vanity as well as the toilet. The bathroom linens were somewhat thin especially the shower towels. The towels were, however, clean. 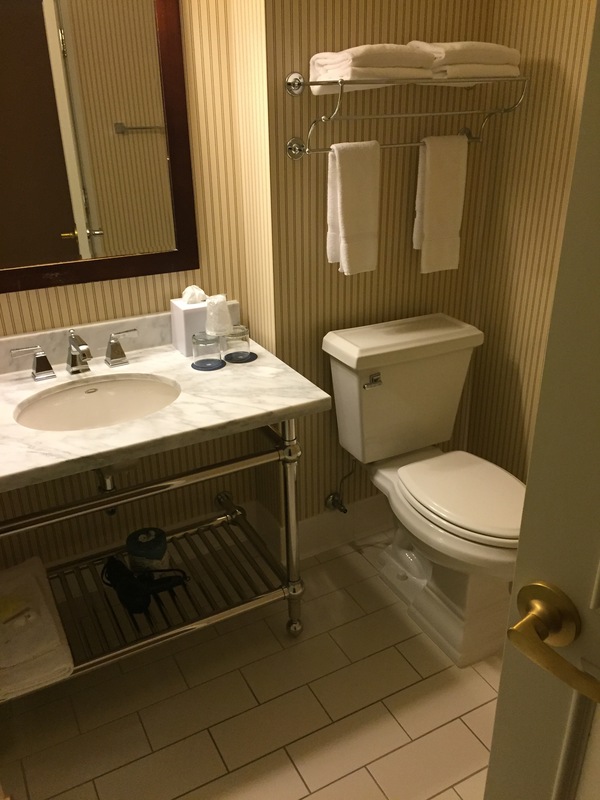 The standard SPG bath amenities were provided as well as a loofah. 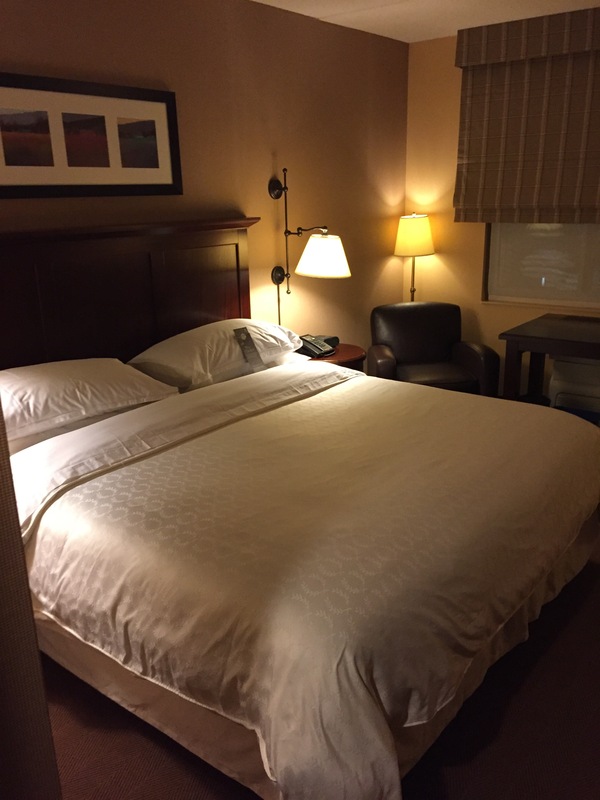 The bed was comfortable and it featured the Sheraton Sweet Sleeper bed. The linens were clean and the room. 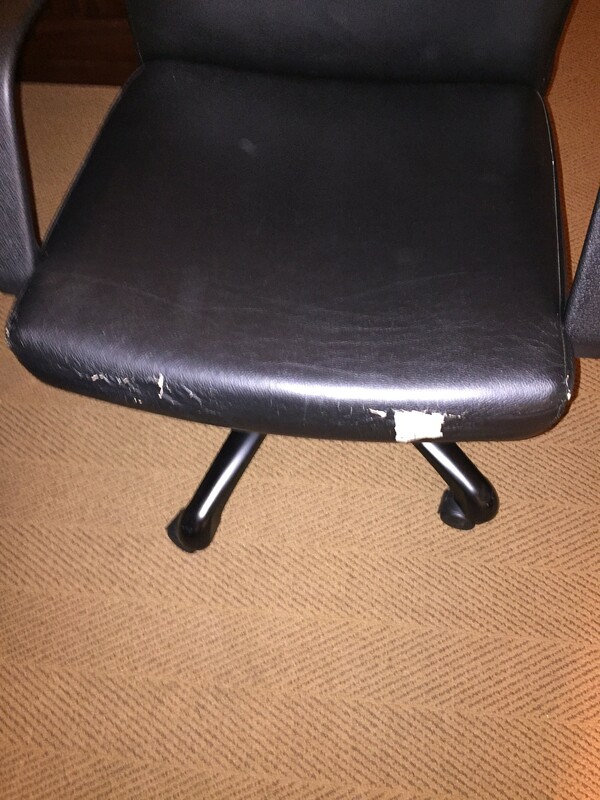 The room only had two noticeable defects: The desk chair was damaged at the base of the seat and there was a large scuff mark across from the bathroom. The room was relatively quiet throughout the night. The only sound heard was a loud wind noise that lasted throughout the night. The temporary club lounge featured a small refrigerator stocked with sodas and water bottles. There was also a bowl with apples and oranges in it. In addition, there were granola and cereal bars available. The area was clean and there were two tables present along with newspapers. I visited the bar for the complimentary appetizer. When I arrived, the bartender welcomed me and he offered a drink. I requested water and presented the voucher. The bartender provided a menu and said that I could order any of the appetizers. I asked which one was most popular and he said that they were all good. 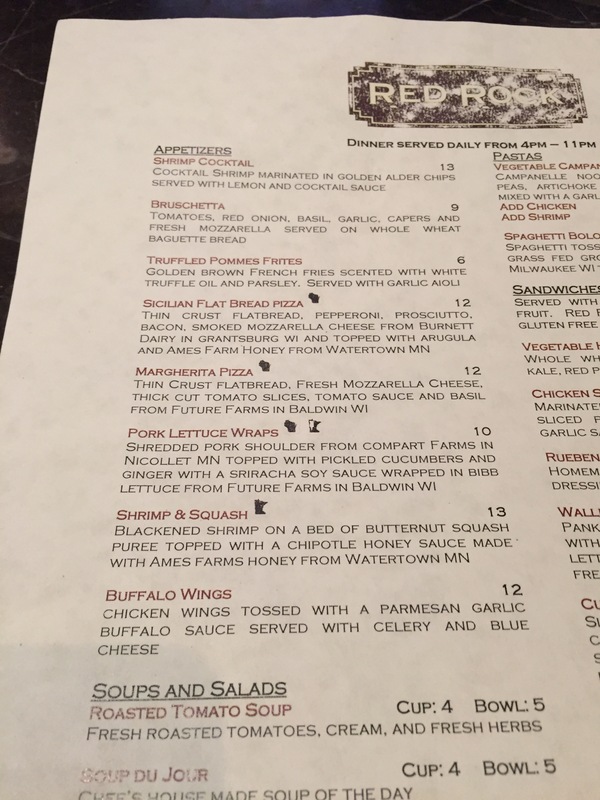 He suggested either the Margarita Pizza, wings or the truffle fries. I inquired if the wings were boneless or bone-in. He said they were bone-in. I ordered the Margartia Pizza. The bartender thanked me and he asked if I wanted to take it to the room. I said I would have it at the restaurant. A television featuring a basketball game was turned on at the bar. The bar area was clean. The bottles were arranged neatly. The bartender suggested a beer and he provided a specials list. Two of the items were out including an angry orchard beer. I declined the beverage and he thanked me. The bartender kept my water glass full. The bartender provided linens and flatware prior to the pizza being served. The pizza was served within 15 minutes. 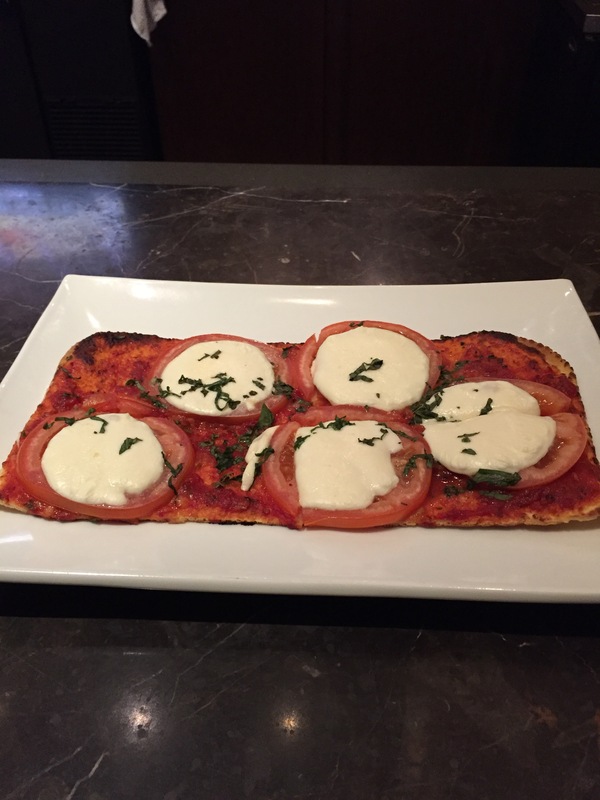 The pizza was served hot and it was cut into four large pieces. It was not served with condiments. The pizza had a good taste. The bread was thin and crispy and the sauce was mild. The sauce was topped with cheese and a few pieces of basil. It was good overall. The portion size was generous. The bartender checked in with me a few times while I was enjoying the meal. After I finished he removed the dish and asked if he could get me anything else. When I declined, he thanked me and said I was all set. I asked if I could sign a tip to the room. The bartender said he already closed the check and he said it was not necessary. In the morning, I got up early and visited the club lounge area. 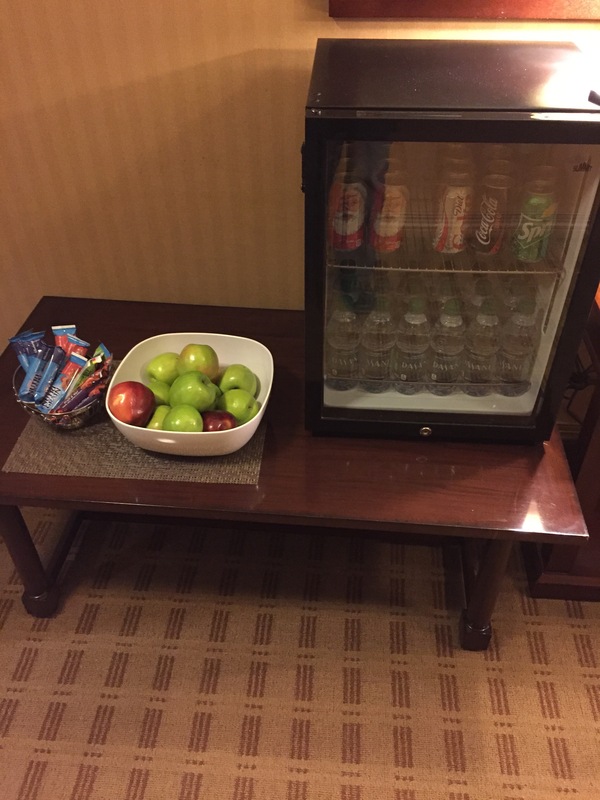 The same amenities were provided as the previous evening. I approached the restaurant and found three colleagues present and zero other guests. The server greeted me and welcomed me. 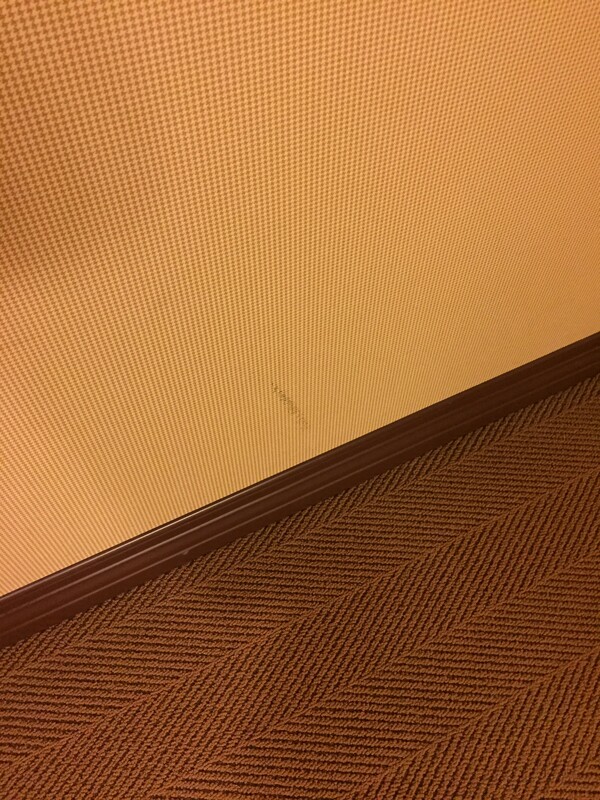 He asked if I was with 3M (The hotel is located in close proximity to 3M’s corporate headquarters). I said no and he offered for me to take a seat. I mentioned that I had a breakfast voucher and he thanked me. He informed me that I could help myself to the entire buffet. The server offered coffee and juice. I accepted and he provided both and offered cream or milk. The server asked me to enjoy. I inquired if I could sign a tip to the room. He thanked me and said he would provide a check. The server, took the voucher and asked me to help myself from the buffet. 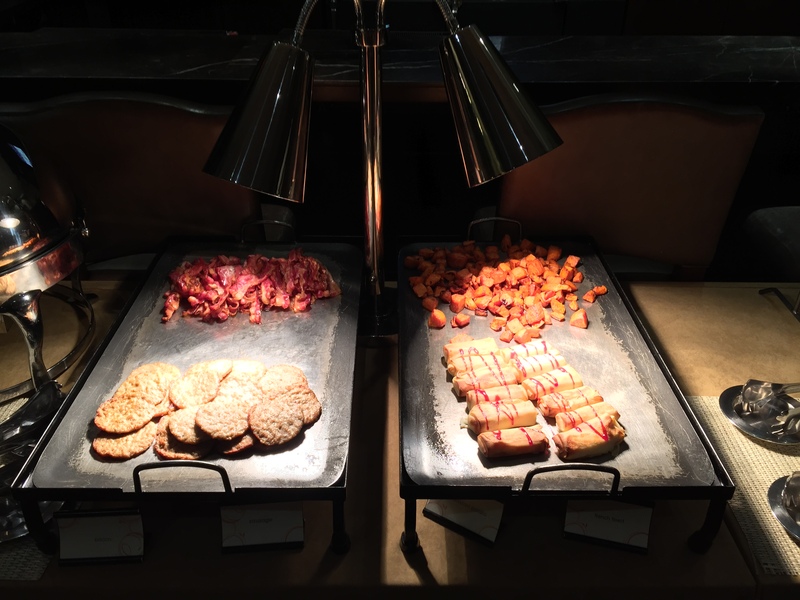 The buffet featured both hot and cold options. The hot items included scrambled eggs with sausage, bacon and sausage, and cheese blintzes. The cold items included two types of fruit, yogurt, cereal and a variety of pastries. The buffet was setup neatly and it appeared that I was the first guest as the entire buffet looked undisturbed. The serving utensils were clean and in good condition. When I returned to the table, the check was present and I signed a tip to the room. The server checked in with me several times to make sure I did not need anything. He asked if I wanted oatmeal and said it was not on the buffet but the hotel offered it. I declined and he thanked me. 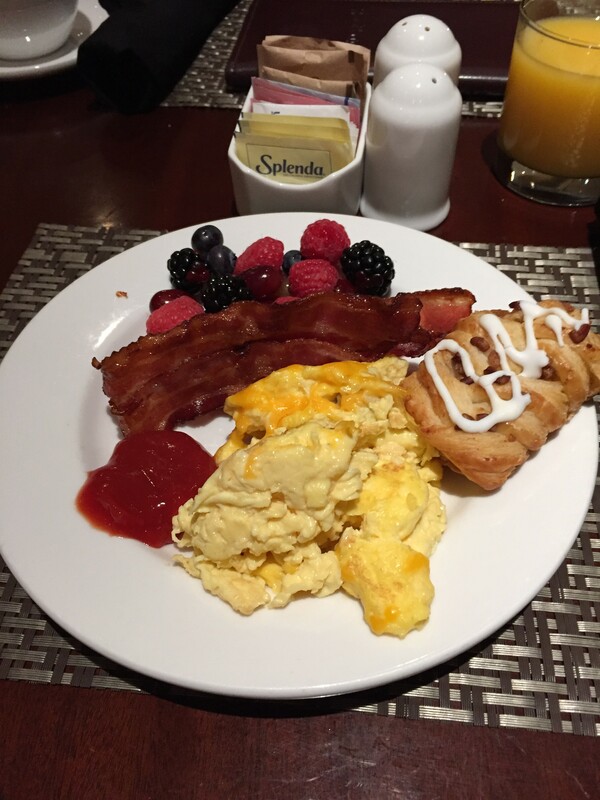 I selected eggs, bacon, fruit and a small pastry. The eggs were cooked fresh and they were served hot. The eggs had a good taste and they were cooked with sausage. The bacon was crispy and it had a good taste and it was also hot. The fruit included berries and it was served chilled. The berries were sweet and fresh and they had a good taste. The pastry was served chilled. It was flaky and it had a good taste. After I finished the meal, the server thanked me and he wished me a good day. I approached the front desk to check out. No colleagues were present when I arrived and zero other guests were waiting. Within a few seconds, a colleague approached the desk from the back office and she greeted me warmly and offered assistance. I requested to check out and the colleague took my keys and she used my name and asked about the stay. I said it was good. She thanked me and she confirmed the method of payment. I accepted the card on file and she offered to email me the folio. I accepted and she thanked me. The colleague was warm and friendly and she thanked me sincerely using my name and she invited me to return. Overall the stay was good. 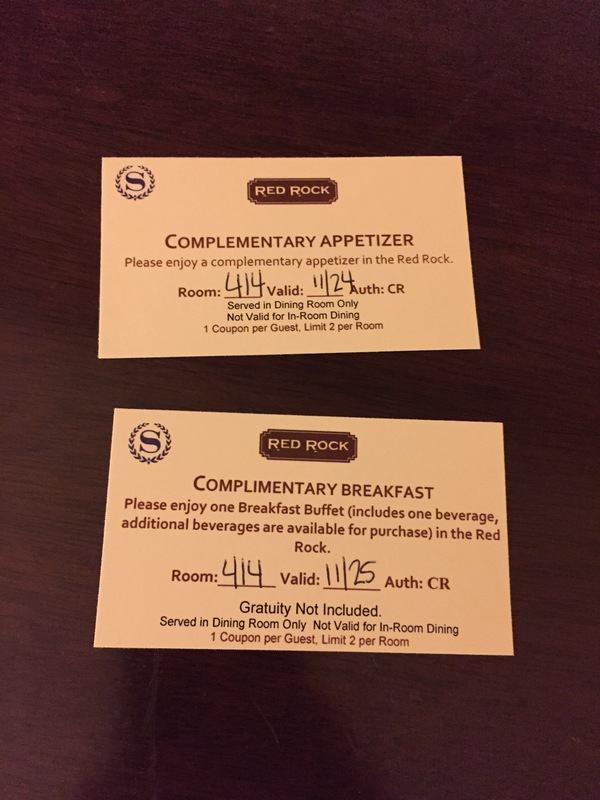 It was a nice surprise getting the voucher for the appetizer and the breakfast buffet. That enhanced the stay. The food was excellent. The service was good overall. I felt all the colleagues I interacted with were polite and they made me feel welcome. I would return to this location in the future.